What are your thoughts on egg nog? A delicious holiday treat, or a custom befitting female deacons? Is non-alcoholic egg nog truly egg nog (or the other way around)? These are the important questions, Father. I am sure you are not being “flip” in asking about nog. Nog, you say. Which it’s too fun a word not to look at. There are meanings of nog which have to do with pegs, and so forth. However, we are mostly interested in the beverage… mostly. That leads us to an alternate meaning of nog, which is a strong ale. Taking the word play up a peg or two, nog is good for what ales you. As a verb, to nog also means to fill in the spaces between bricks and so forth. Perhaps that also refers to filling in the spaces between the heavy things we might eat at this time of year. Nogs and flips (both of them are beverages made with beaten eggs) were standards of yesteryear, usually but not always with the addition of alcohol. After all… why not? It can be argued that that if anything less than wholesome arrives in the drink by way of the eggs, then the alcohol is all the more necessary. Why risk it? Right? Besides, our forebears knew more than their prayers. In the mighty Aubrey/Maturin series, our heroes enjoy various flips… hence, nogs. We’re talking about the lads of the 18th and 19th c. Royal Navy, in the days of the great sailing ships. (Think tots and rum rations.) So… no, this is no mere “deaconette” drink. Heat the remaining sherry with the nutmeg, sugar and butter. Gradually add the hot mixture to the egg mixture (don’t let it curdle). Then “flip” the results back and forth between two jugs until it is frothy and creamy. Nog has more eggs, especially yolks. We can get into shrubs and dog’s nose another time. And be sure to drink it from a noggin (a cup for drinking nog) obtained from my Swag Store! Since some of you classify as “Zed Heads”, you might go for that particular line… Zed Noggins, as it were. Get it? Huh? This entry was posted in Fr. Z's Kitchen, Lighter fare, O'Brian Tags, Preserved Killick and tagged Aubrey/Maturin, eggnog, flip, nog. Bookmark the permalink. 12 Responses to ASK FATHER: Egg nog – A holiday treat for all, or only for deaconettes? I really enjoyed this post–light and frothy with a good bit of substance! Haven’t done that in years, but a friend had a bottle of Pennsylvania Dutch egg nog (w/brandy). Delicious. Also the Sam’s Club Members Mark egg nog (w/rum). 6-8 ounces of favorite liquor: I use a mixture of bourbon and rum; some like brandy. 1. Separate eggs. Put whites aside. I put them in the freezer to chill, as they seem to whip up better. 2. Whip the yolks till they are lighter color and thicker; then gradually add the booze. 3. Next add the sugar gradually. 4. Now add the cream and milk gradually. 5. Put this mixture in freezer to chill. 6. Take out white and whip them until nearly stiff. Don’t worry too much about how stiff. 7. Carefully fold the whites into the egg/cream mixture. You can use the mixer, but be careful! You may end up breaking down the whites you just labored to work up. I use a spoon or spatula. The goal is to distribute the whites in the rest of the mixture. You can either chill this for later, or else dive right in, depending on how cold you want it. The whites will still tend to rise to the top, but you just sort of re-mix it when you serve it up. I find that when I use more bourbon, it tastes stronger; the rum is more deceptive. But in fact, there’s not really that much alcohol in it. The whole bowl has four to six shots, and it’s meant for 8-10 people, so it shouldn’t be a problem for most. But if you leave out the booze, it’s not going to have much taste. I suppose you could use something like imitation rum flavor, but…yeachh! 1. Separate yolks and whites of the eggs. 3. Beat yolks and add sugar. Mix well. 4. Combined liquors, then slowly add to the yolk and sugar mixture, slowly beating it all the while. 5. Add cream and milk and mix thoroughly. 6. Beat the egg whites into stiff peaks and gently fold into the cream-liquor-yolk mixture. 7. Let this sit in the refrigerator for several days. Taste frequently. * Separating the white and beating them is the critical step. Rather off-topic, but this talk of nogs and noggins reminded me of a BBC children’s TV series from when I was a lad – “The Saga of Noggin the Nog”. It was about the adventures of a little Norseman and was quite enchanting. If I remember aright he had an enemy called Nogbad the Bad! Just curious – why the association of egg nog with female deacons? Seems to me that deaconettes and those that advocate for them would tend to be of the more liberal persuasion and would reject a drink with such oppressive patriarchal Western overtones and instead would opt for a Cuba Libre. I’m definitely not a deaconette and I love eggnog during the Christmas season. My recipe is remarkably similar to Fr. Fox’s recipe. I’m a millennial, so everyone knows that I use a bit more booze than the good Father posted above. Also, I mix the eggs, sugar, and alcohol together in step one and age that in the fridge for three weeks. After aging, the mixture is strained, the dairy is added, and it’s served. I think the aging in the fridge is more than enough time for the alcohol to kill anything that might be in the eggs. The aging time also mellows out the eggy taste. Used to love eggnog, but dairy and I no longer do well together. I shall have to try the flip as a worthy seasonal alternative. Washington’s recipe is not for amateur tipplers. It packs a punch. An old Colonial recipe: Fill a tankard half full with stale brown bread crumbs, fill the tankard almost to the brim with household beer, add a little egg and a little cream. Insert a red hot poker into the mix, and stir until the drink is steamy. Drink up. Which it’s an excellent series, the Aubrey/Maturin novels. 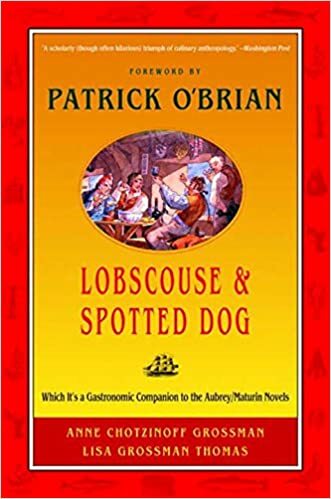 The series begins in port one fine evening at the Governor’s House, with Aubrey and Maturin nearly engaging in fisticuffs while listening to a chamber quartet. Then, the next day, a pot of hot chocolate heals the divide between the new ship’s captain and the new ship’s surgeon. Soon, a rattle of anchor chains and it’s off to roam the Mediterranean. Though, if Killick bestirred himself in the galley and made eggnog, it would probably never make it past the Gunroom to reach Aubrey’s tankard. Which it’s a rare victory for the lads over the skipper.